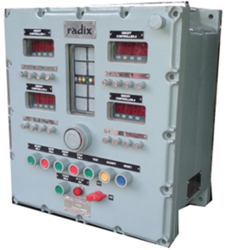 Radix manufactures high-quality control panels for a wide variety of applications. 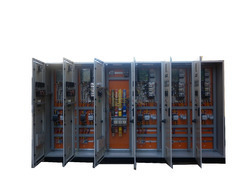 Choose from Fiber-Reinforced (FRP) Panels, Annunciator Panels, Purge Panels, Variable Frequency Drive (VFD) Panels, Mimic Panels, PLC Panels with Flameproof panel options and more! Capacitors : L&T, ABB, Epcos. FRP Panels stands for Fiber Reinforced Plastic (FRP) Panels, they offer several benefits. FRP has very low density and is invariably lighter than the same volume of aluminium or steel. It outperforms aluminium and steel in terms of mechanical strength. It is more impact-resistant and does not change shape when ruptured like most of the metals. The coating that covers FRP panels can be tailored for greater resilience or hardness. FRP Panels is also more chemical resistant making it an ideal panel material in areas where chemical spillages may occur, areas typically found in water treatment, chemical,paper, and petroleum industries. FRP panels are long-lasting as they will not corrossion free, unlike their metal counterparts. From a safety standpoint, FRP material is a bad conductor of electricity, yet is versatile enough to be made to conduct electricity if required by our customers. 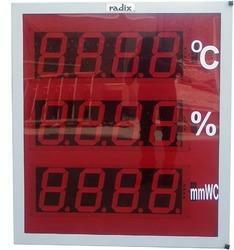 FRP panels also have great heat-insulation; they maintain their temperature and are easy to touch in normal conditions. 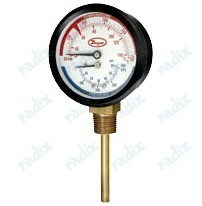 With low-thermal expansion, making them ideal for applications with fluctuating temperatures. 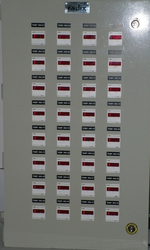 Thyristor Panels are generally used to control Process parameters, commonly use in Furnaces, Owen or Heating Chambers etc where thyristor controls current flowing through the coils furnace. With Radix installed sensors/Transmitter giving 4-20mA signals as output signal to PID controller to trigger thyristor's gate inorder to maintain the temperature at the set point. This is a power saving method as the thyristor is triggered to percentage of output rquired and so doesnt remains on, on unnecessary intervals as against the traditional method of dampers. 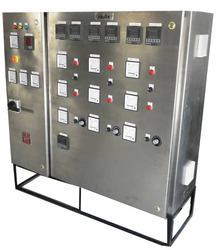 The Main purpose of this panel is to Test Instrument like single phase three phase motor, thyristors transformers, various parameters like current, voltage, resistances etc.Acting as a 24 Vdc power supply, DOL(direct online starter) starter, star delta starter, Radical calibrator, multimeter, variac, 110V DC supply, etc. 3 phase and single phase variac to vary voltage for testing of thyristors and transformers. Radix has supplied a wide range of Flameproof panels meeting almost every kind of applications. 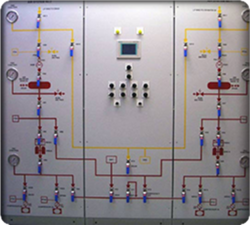 All our FLP panels are certified under Gas groups IIA, IIB, IIC and are especially designed to operate in hazardous environment. 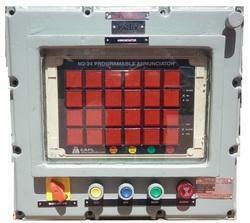 Looking for Automation Panels ?